We are writing to you in the name of 350,000 Bosniaks, citizens and residents of the USA. The reason of this letter is the most recent situation in Bosnia and Herzegovina demands an immediate and proportional reaction by the international community. 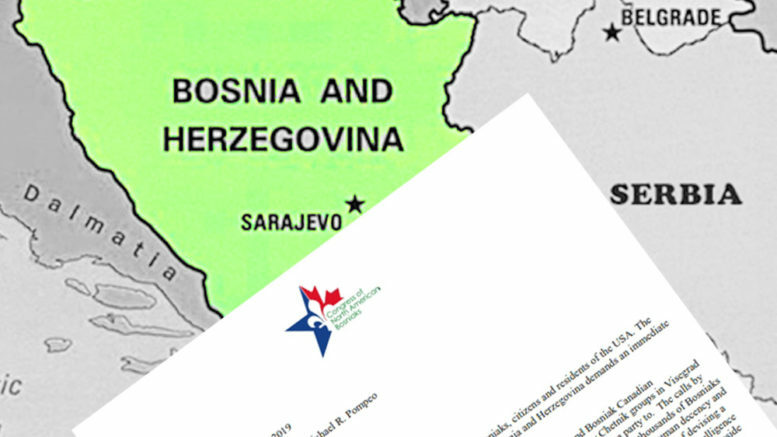 Two events cause significant concern for the Bosniak American and Bosniak Canadian population. The recent gathering of the Serbian terrorist, paramilitary Chetnik groups in Visegrad is a direct attack on peace in Bosnia and Herzegovina, to which Serbia is a party to. The calls by the gathering warmongering and bloodthirsty groups at a sacred place where thousands of Bosniaks were killed during the last two wars in Bosnia and Herzegovina is an affront to human decency and a direct threat to peace in the region. Another is the case of the neighboring Croatia of devising a plot intended to portray Bosnia and Herzegovina as terrorist heaven falsely. Croatia’s intelligence service threatened a Bosnian citizen into transporting weapons and explosives to a mosque inside Bosnia and Herzegovina. If the weapons were then discovered, the cache would be used to characterize Bosnia and Herzegovina as part of a terrorist plot. The irresponsible and despicable behavior of the neighboring countries is a continuation of the pre-war and post-war acts and tactics of destabilizing Bosnia and Herzegovina and scapegoating Bosniaks. We demand the United States to condemn in strongest possible terms the continuing attempts of Serbia and Croatia, with their satellite apparatus in Bosnia and Herzegovina to undermine peace and cooperative efforts in the region. We challenge the partners in the peace accord to expedite membership for Bosnia and Herzegovina in NATO. Bosnia and Herzegovina has been a proven partner in many of the UN and NATO-led missions around the world and the NATO membership would lead to more stability in the region.